The history of Australian landscape painting is a fascinating journey through culture, symbology and the ever-changing relationship between people and land. We will follow the winding track from Aboriginal art, to the Australian Impressionists and Surrealists, to artists who pioneered a new way of seeing the bush – and finally we'll take a look at contemporary Australian landscape painters. Australian indigenous art, which dates back more than 30,000 years, cannot be separated from a deep relationship with the landscape. Aboriginal art was inspired by what was called 'the Dreaming'. While some works of Aboriginal art do explicitly show the physical relationship between different aspects of the landscape, the mythical meaning is always paramount. The paintings also mirror changes in society: trading patterns, the growing influence of governments and churches, and the struggle for survival. When a local schoolteacher introduced paints and canvas to the community, the myths and stories of the Aboriginal people were committed to a permanent substrate for the first time, reaching the West on a much larger scale. The Australian Western Desert artists of Papunya Tula were one of the first groups of Indigenous painters, and this new arts movement formed the basis of what is now a significant and global art movement worth more than $200 million a year..
Albert Namatjira (1902-1959) was perhaps the best known Aboriginal painter, and one of Australia’s great artists. He blended traditional use of colour with Western-style landscapes, which brought him fame and Australian citizenship – a first in a time when Aboriginal people had few rights. Namatjira’s intricately detailed watercolours of the Australian outback gave rise to the Hermannsburg School of Aboriginal art. His early works transmitted the same spiritual connection with the land as more traditional Aboriginal art, and he represented his love of trees through lovingly rendered portrait-like paintings. Unfortunately, the tragedy of racial injustice destroyed Namatjira's career and life. He was imprisoned for allegedly supplying alcohol to Aboriginal people, and by the time he was released had lost his desire to paint and enthusiasm for life: he died the following year, aged only 57. European artists landing on Australian soil in the late 18th Century had to find a whole new artistic language to convey the imagery they were seeing for the first time. The painting traditions of their native countries were not up to the job of putting across the unique qualities of this landscape, with its complex colours and surprising sense of the random. At first, artists aimed to represent what they saw as accurately as possible, but later a true Australian style of painting began to develop. The mainly Melbourne-based Heidelberg School spearheaded this movement and strove to present the spirit of the Australian landscape through their work. Tom Roberts, an English immigrant working in the 1880's, painted the bush, focusing on the lives of ordinary Australian people and the triumph of pioneers over their wild environment. One of Roberts' most famous works is Shearing the Rams, which depicts the wool industry – Australia's first export industry and a crucial part of Australian rural life. A Break Away, considered an icon of Australian art, reflects a time of drought during the pioneering days of the pastoral industry, which ended in the 1890’s. Born in Melbourne in 1855, Frederick McCubbin was the first Australian-born artist to make a name for himself. His style was probably the most impressionistic of the Heidelberg group, and he was highly influenced by his long association with Tom Roberts. He was inspired to paint Lost, his most famous work, by the discovery of twelve-year-old Clara Crosbie after 3 weeks lost in the bush. Unlike artists such as Roberts and Streeton, McCubbin showed the more melancholy side of the Australian's relationship to the landscape, with the pioneer often depicted being beaten by the bush. Arthur Streeton "Golden Summer, Eaglemont"
Sir Arthur Streeton, born in Australia in 1867 and knighted for his service to the arts, created paintings now amongst the most collectible of Australian art. As Australian Official War Artist during the 1st World War, he also painted the landscape of scenes of war. Elioth Gruner, seven-time winner of the Wynne Prize, produced work that was an intense meditation on the nature of light. He was one of the most popular landscape artists working in Australia between 1910 and 1939. Born in 1877, Hans Heysen was a German-born Australian artist famous for his watercolours of magnificent Australian gum trees. His work also illustrated the dry, barren landscapes of the Flinders Ranges, and men and animals working in the Australian bush. Heysen was an early conservationist who fought for the flora of his beloved Adelaide Hills, the inspiration for many of his paintings. He was profoundly affected by the tension of the first World War when he was regarded with suspicion and hostility due to his nationality. Though not a particularly experimental artist, his work is a faithful record of the Australian regional way of life. In the post-WWII years, Sidney Nolan and the other Symbolic Surrealists brought a new, more dynamic and modern approach to the by then lacklustre Australian art scene. A fascination with Australia's myths and icons, such as legendary bush ranger, Ned Kelly, inspired Nolan′s work. He fused an emphasis on the land with its people, animals, history, and the Aboriginal culture, along with what he called “a kind of Bible overtone”. Russell Drysdale, working from the 1930's on, produced paintings that show Australia through new eyes: a place in decline from a land of freedom and opportunity, to one of broken dreams. One of his best-known works is Sofala, where the promise of the Australian landscape captured by the Heidelberg School painters is all too clearly missing from the desolate scene of the New South Wales town of Sofala. Influenced by the 'new' art emerging from Europe, Fred Williams, born in Melbourne in 1927, was one of Australia’s most important artists, and one of the twentieth century’s major landscape painters. When he returned to Australia, Williams looked to the approach of Aboriginal artists to find a way of interpreting the vast, mostly flat landscape of Australia, and in this way brought a new vision of Australia's landscape. 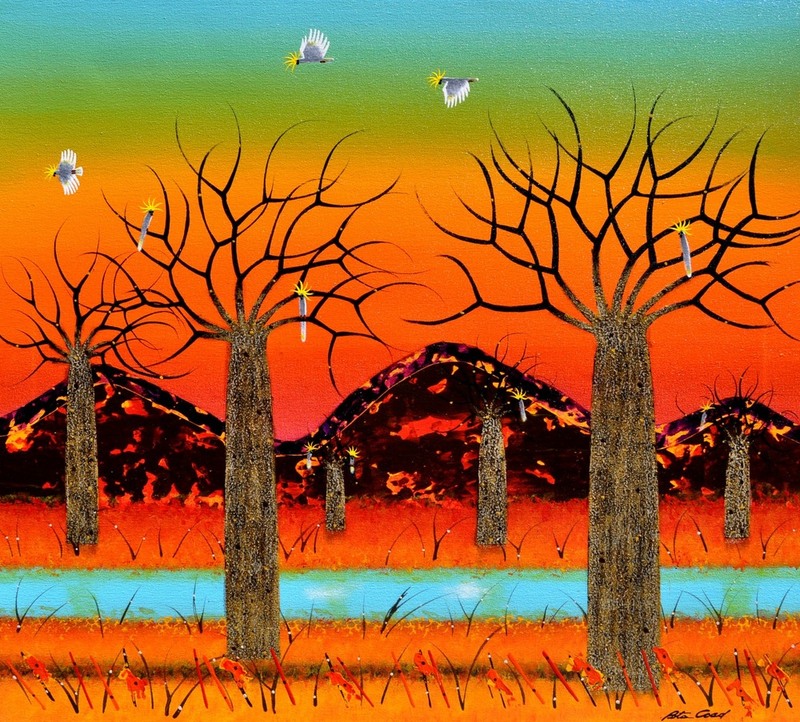 Colin Parker is a figurative Australian landscape artist who captures the harsh isolation of the outback in bold and colourful lines. Born in New South Wales in 1941, he has been an Artist in Residence at both Ayers Rock and Kakadu and is a respected Art Judge and four-time Wynne Prize winner. Colin is a largely self-taught artist whose paintings feature in many corporate collections around the world – including that of the British Royal Family. Born in 1950 in Melbourne, Robert Fisher brings a uniquely personal approach to the Australian landscape. 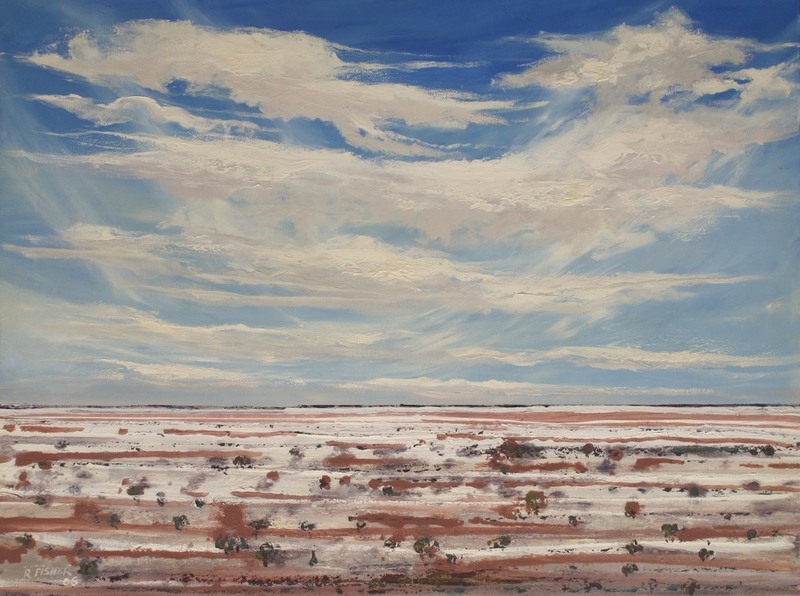 His powerful paintings are inspired by the outback and communicate a heartfelt response to the richness of this place, and its sense of space. Of note, is the series As the Crow Flies, where he encapsulates the “many moods of the outback” including Broken Hill and Birdsville after literally flying around these areas. Robert's passion for the bush was ignited when he visited the Ghan as a 16-year-old. Based on the Sunshine Coast of Queensland, and born in apartheid South Africa in 1950, Mel Brigg is a self-taught artist. His landscape paintings are peopled with globe-wide seekers portrayed in a metaphorical way. Mel′s work communicates a deep commitment to the well-being of people and the planet – and he bears this out in his support for various charities. He has also staged exhibitions to draw attention to political detainees. He aims to create an emotional response in the viewer. Mel has had solo exhibitions and joint exhibitions all over the world. Ken Knight, a native of Sydney born in 1956, is one of Australia's most admired landscape painters. He is an impressionist artist who expresses his enthusiasm for the Australian landscape by painting en plein aire – using oils in a spontaneous and free manner. His images come from a direct response to the subject and aim to capture the essence of a scene, reducing detail so that viewers can make their own intimate interpretation. His work communicates a range of moods, from rural pastures lit by the harsh noonday sun, to intricate plays of light on the beaches and coves of Sydney Harbour. Born in 1957, Palla Jeroff developed his proficiency in oil painting from an early age in his homeland of China. When he fell in love with both the aesthetic beauty and the easy-going culture of Australia in the early 1980’s, he began to create his own unique interpretations of the Australian landscape with the use of rich colour. Since then, Palla’s paintings have become extremely successful and widely recognised on both national and international levels. Today Australian landscape painting continues to offer a rare richness and vibrancy, and is received positively around the world. Innovative contemporary Australian Indigenous artists adapt new media to produce powerfully moving work, and pioneering artists like Ken Knight use art to change perceptions of the country. Mel Brigg, himself inspired by the spirituality of indigenous peoples, portrays increasingly relevant issues such as forced immigration and finding home in this land of hybrid influences. The influential work of Australian landscape artists explores ideas, illuminates issues of social change, expresses emotion, and shows the viewpoints of the people who inhabit this landscape.